Jardinière: Go Figure: World Cup Ratings Soar . . . but is it Best in Show? Go Figure: World Cup Ratings Soar . . . but is it Best in Show? My sources at ESPN have shared with me the ratings from ESPN and ABC World Cup telecasts this past week, and, my, they are pretty impressive. Despite uninspired play by tournament favorites so far, the ratings are up from four years ago in each corresponding match by, at the very least, a whopping 56 percent, and that was the match between Mexico and Iran (!). England's match against Paraguay bested the '02 match in that time slot by 63 percent, and that fantastic Trinidad & Tobago draw with Sweden marked an 85 percent increase in viewers since '02. Finally, Monday's ESPN telecast of the U.S. match against the Czech Republic was seen in an average of 2.14 million television homes: the most-watched and highest-rated soccer telecast ever on ESPN2, as well as the highest-rated program on ESPN2 this year (clearly beating the spelling bee; sorry, kids! Let's just hope you don't end up on the "ocho"). I am awaiting word on the demographics to assess this significant development. Are intellectuals abandoning McSweeney's for their nearest sports bar, as reported in Slate.com? Have women been heeding my call to leave the box scores to their male folk and check out the square mug of Michael Owen? Or have US citizens grown weary of being a global pariah and decided to rejoin the international community (without UN approval) through some sporting R & R? It will be interesting to see if the ratings hold up once the US team exits the competition. My hunch -- based on returns at our local, the Celtic Knot -- is that they will. That said, what remains to improve in the telecasts -- besides England's offense -- is the commentating. Groan. As is usual in competitions of this magnitude, producers have paired a wonky former player-expert (Marcelo Balboa, late of the MLS team the Colorado Rapids) with an experienced broadcaster (Dave O'Brien) less familiar with the sport. In the matches I have watched (only a few, I've got a degree to finish here), the wonky former-player Balboa takes soccer very seriously. Too seriously. At our expense. As is typical of inexperienced announcers, Balboa abhors a telecasting vacuum. But even more unfortunate, he fills that vacuum with his considered and emphatic prejudices about the team he no doubt hopes will lose. Get this guy some stats or some stories, or another wonky guy to spar with on air, to make his repeated pronouncements of death remotely dynamic or interesting. He's a downer. I think I can summarize his knowledge of football thus: He knows that the ball is round and that the goal's net is not made of barbed wire, but he knows hardly anything beyond that. Marcelo Balboa was constantly having to interrupt to correct O'Brien's laughably wrong assessments of matters on the pitch. Just to give one mad-cap example, a Costa Rican defender stuck out a hand to pull Schweinsteiger's shirt in the box. Schweinsteiger (I think it was him, but I might be remembering incorrectly) dove and the ref ignored him. It was one of those cases of: sure it's technically a foul, but far too minor to merit a penalty. O'Brien, however, took this as an opportunity to say: "That just shows that the idea that you cannot use your hands in soccer is a complete misnomer". As such he managed to 1) misuse the word "misnomer", 2) confound the the many possible senses of the term "use your hands" 3) ignore the fact that shirt-pulling is illegal in football. Well said, and too true (and especially appreciated by la Jardiniere for having pointed out O'Brien's misuse of language). 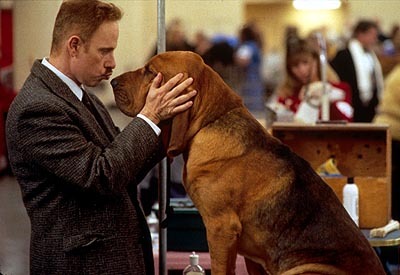 Upon relating O'Brien's malfeasance to my pal Colleen (not the first time she has appeared in this blog, and surely not the last), Col reminded me of the most keenly observed depiction of the Dave O'Brien phenomenon, in 2000's dog show satire, Best in Show. Remember Fred Willard's turn as Buck Laughlin, the color commentator assigned to the dog show? ¶ "Now tell me, which one of these dogs would you want to have as your wide receiver on your football team?" ¶ "And to think that in some countries these dogs are eaten." ¶ "I went to one of those obedience places once... it was all going well until they spilled hot candle wax on my private parts." Classic. But as Col pointed out, Buck's best turn may have been in demanding from the bloodhound what he considered the proper grooming: why doesn't the dog wear a Sherlock Holmes detective hat and carry a pipe in his mouth? Really, why not? Dave O'Brien is like dat. Of course, to my knowledge, he hasn't poked fun at a blind guy for wearing sunglasses indoors. But almost five weeks remain in the tournament. You never know. Stay tuned. It sounds like I am not missing anything watching the American commentary. Though I must confess that that the English commentary, while better technically, still suffers from commentators talking to hear themselves. That said. When I am awake at 3 am on a Tuesday I have watched Monday Night Football. Thankfully they kept Al Michaels and John Madden commentary. But the blokes they have during commercial and half time are terrible. There needs to be an UN embargo on importing native games to foreign countries. Hi, John. Thanks for your comment. Yeah, what's surprising about O'Brien -- or maybe not so surprising -- is that he comes from baseball, a sport which thrives on the acumen of its fanbase. That is, you'd think he would have prepped a little more by studying some soccer stats. Then again, baseball being our native pastime, where O'Brien is at his worst is when he tries to sound worldly, my favorite possibly being "Ah Germany, the land of beer and sausages." (!!!) It's like a 90 minute Phil Hartman gag. Speaking of which, seeing as you're in England, John, see if you can get some DVDs of the Paul Whitehouse show, _The Fast Show_. They do brilliant parodies of British football announcers (and players), the most hilarious one being a series of post-match interviews with "Julio Geordio," a South American player recruited to Newcastle. . . In the first interview, Julio can't speak a word of English, and "Andy Gray" doesn't know what to do with him. As Julio gains confidence and becomes a star on the team, he picks up typically Geordie phrases and blurts them out amid his unintelligible Latin American speech. "So Julio, that was one special goal you made there." "Clucka do laca ponta cardo no binca just stook me toe ouwt and eet went in." "So Julio, how are you enjoying life in England?" "Polaca de cuppa de garda no walka ai shagged that Dani Behr, like." Pee in yer pants funny. Whhooops! I made a mistake. The Julio Geordio interviews aren't in the Fast Show (known as "Brilliant!" here in BBC America), they're on the Harry Enfield show (the show Paul Whitehouse was on before he did the Fast Show with Charlie Higson.) I wish to hell BBC America would show these programs again. How many forensic dramas can we take? Though I understand "Spaced" in coming up soon. And please oh please, Caroline Aherne, nail that rehab and make more episodes of the Royle Family!